Petrosillo's presentation included original manuscript research conducted at the Vatican and University of Bologna, as well as observations from teaching literature about hawks and falconry in her fall 2018 FYS. Sara Petrosillo, University of Evansville assistant professor of English, recently published the article, "Flying, Hunting, Reading: Rethinking Falcon-Woman Comparisons" in a special issue on "Species and Gender" in the peer-reviewed journal Medieval Feminist Forum, vol. 54, no. 1, 2018, pp. 9-33. Sara Petrosillo, University of Evansville assistant professor of English, presented research on manuscripts at the 2018 Medieval Association of the Midwest Conference "Exploring Space in the Middle Ages." The conference took place from October 4-6 Purdue University. Petrosillo's paper was titled, "Manuscript Space: Narrative Diminishment in Yonec and the Harley 978 Hawking Treatise." Robert Baines, assistant professor of English, gave a lecture at the Working Men's Institute Museum and Library in New Harmony on August 7. The lecture was organized by the Friends of the Working Men's Institute and was titled "Finnegans Wake: How to Read." The Department of English at the University of Evansville has announced the winners of its annual Virginia Lowell Grabill and George Klinger academic writing awards. The Second-Place Grabill Award went to Ian (Charlie) Ericson for his essay “How Does Becket Depict Consciousness in Malone Dies?" Mark Cirino has been hired as literature consultant on the forthcoming cinematic adaptation of Across the River and into the Trees, starring Pierce Brosnan and Isabella Rossellini. Cirino is an associate professor of English and the Melvin M. Peterson Endowed Chair in English at the University of Evansville. The film, directed by Martin Campbell, is a dramatization of Ernest Hemingway's 1950 novel. Cirino will assist the cast and crew in their attempts to film the only Hemingway novel that has never been made into a movie. Filming begins in Venice, Italy, on April 23. Robert Baines, assistant professor of English, gave a lecture to the James Joyce Society on Friday, February 16 at Glucksman Ireland House on the NYU campus. The lecture was titled "'Vico Influenced Joyce': Reappraising an Ideal History." An article written by Mark Cirino and Amanda Oaks has been published in the current Hemingway Review. Their article, “Wise Blood: Menstruation, Fertility, and the ‘Disappointment’ in Hemingway’s Across the River and into the Trees," analyzes a crucial gap in the text that has presented a critical conundrum since the novel’s publication in 1950. Cirino and Oaks conceived of this article during her ENGL 399 class as a UE student. Oaks is currently pursuing her MFA at Chatham University. Cirino is associate professor and Melvin M. Peterson Endowed Chair in English at the University of Evansville. The Eric Hoffer Book Award has announced that Mark Cirino’s Hidden Hemingway: Inside the Ernest Hemingway Archives of Oak Park has won the 2017 gold medal in the reference category. Cirino, an associate professor of English and the Melvin M. Peterson Endowed Chair in English, co-wrote Hidden Hemingway with Robert K. Elder and Aaron Vetch. Earlier this year, Hidden Hemingway won the gold medal in the reference category by the Independent Publisher Book Awards. University of Evansville associate professor of English and Melvin M. Peterson Endowed Chair in English Mark Cirino has co-written an article that appeared in the Huffington Post. The article was written in honor of the 100th anniversary of Ernest Hemingway's high school graduation. Cirino co-wrote the article to accompany rare and evocative images from Hemingway's high school years. Many of these photographs appeared in Hidden Hemingway: Inside the Ernest Hemingway Archives of Oak Park, a book Cirino also co-wrote. The University of Evansville Department of English has announced the winners of the Virginia Lowell Grabill Awards for academic writing and the George Klinger Prize for best academic essay. The Third-Place Grabill Award went to Samantha Petitjean. The Second-place Grabill Award went to Taylor Gates. The First-place Grabill Award went to Sydney Blessinger. The George Klinger Prize was presented to Lydia Crain. The Department of English at the University of Evansville invites all members of the campus community to its sixth annual literary conference on April 21 and 22. On Friday night, acclaimed author Jacqueline Briggs Martin will appear at the Melvin M. Peterson Literary Forum to give the Hemminger-Brown Lecture, entitled “Gathering Stories Along the Way,” Her lecture will begin at 7:00 p.m. in Harkness Hall (Room 162), Schroeder School of Business Building. On Saturday morning, students will present their conference papers, with panels starting at 9:30 a.m., 10:45 a.m., and noon in Rooms 271 and 272 in the Schroeder School of Business Building. Following the final panel, the department will award its Grabill and Klinger writing prizes. Mark Cirino's recent book, Hidden Hemingway: Inside the Ernest Hemingway Archives of Oak Park, was awarded the Gold Medal in the Reference category of the 2017 Independent Publishers Book Awards. Cirino, associate professor and Melvin M. Peterson Endowed Chair in English, co-wrote Hidden Hemingway with Robert K. Elder and Aaron Vetch. Kent State University Press published the book in 2017. Amber Pouliot, British Studies professor at Harlaxton, and Kristina Hochwender, associate professor of English at UE, recently co-authored an essay. The essay was about Hochwender’s use of a digital humanities project developed from a conference co-organized by Pouliot in 2015, called Placing the Author. In addition to the conference, Pouliot and her co-organizers curated the Postcard Project, which invited literary tourists to post digital postcards of sites associated with nineteenth-century authors. During the spring 2016 term at Harlaxton, Hochwender asked her students to take part in the Postcard Project and to produce their own digital postcards as a reflective learning exercise. The essay has just been posted to the Journal of Victorian Culture Online. You can follow the English department on Twitter at @ueenglish. At its annual Chutney literary conference, the Department of English presented the 2016 Virginia Lowell Grabill and George Klinger Writing Awards. Robert Baines, assistant professor of English, gave a paper at the recent annual national American Conference for Irish Studies at Notre Dame University. The national ACIS conference is America's largest Irish studies conference. Baines's paper was titled "'Let us be tolerant of antipathies': Opposing opposition in Finnegans Wake I.6." Mark Cirino, professor of English at the University of Evansville, has published a new book, Reading Hemingway’s Across the River and into the Trees, as part of Kent State University Press’s “Reading Hemingway” series. For more information on the book, click here and here. Mark Cirino, associate professor of English and Melvin M. Peterson Endowed Chair in Literature, has published a new book, Reading Hemingway’s Across the River and into the Trees, as part of Kent State University Press’s “Reading Hemingway” series. Cirino was a Global Scholar in 2012-13, which allowed him to travel to Venice to research the novel. Several recent UE graduates contributed to the preparation of Cirino’s book as part of ENGL 399, Independent Study in Literature: Jenelle Clausen, Rachel Cochran, Nick Holder, Kevin Kay, Amanda Oaks, Natalie Updike, Samantha Urban, and Susan Vandagriff. Mark Cirino, assistant professor of English at the University of Evansville, has published a new book, Ernest Hemingway: Thought in Action, from the University of Wisconsin Press. The book offers a new look at Hemingway, revealing a concern with consciousness similar to his predecessors and contemporaries William Faulkner, James Joyce, Virginia Woolf, Henry James, and Marcel Proust. Although much has been written about the author’s love of action — hunting, fishing, drinking, bullfighting, boxing, travel, and the moveable feast — Cirino looks at Hemingway’s focus on the modern mind and interest in consciousness. Hemingway, Cirino demonstrates, probes the ways his characters’ minds respond when placed in urgent situations or when damaged by past traumas. 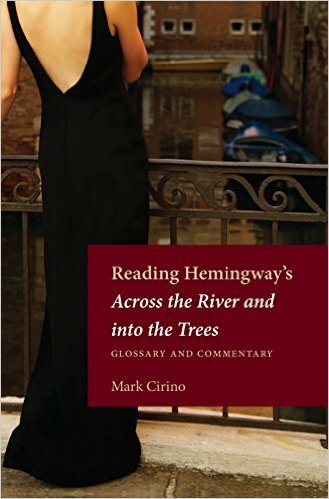 In Cirino’s analysis of Hemingway’s work through this lens — including such celebrated classics as A Farewell to Arms, The Old Man and the Sea, and “Big Two-Hearted River” as well as lesser-known works including Islands in the Stream and “Because I Think Deeper” — an entirely different Hemingway hero emerges: intelligent, introspective, and ruminative. “Cirino … collapses the distinction between thought and action that has traditionally typecast Hemingway as an anti-intellectual dolt — the ‘he-man’ of American literature,” said Kirk Curnutt, author of Coffee with Hemingway. Cirino is the coeditor of Ernest Hemingway: Geography of Memory and the general editor of Kent State University Press’s “Reading Hemingway” series. He is also the author of two novels, Name the Baby and Arizona Blues. Ernest Hemingway: Thought in Action is available from the University of Wisconsin Press.